Simon Leyshan and Holt Meyers have created a luscious home in Maleny. Simon Leyshan and Holt Meyers had lived in some beautiful homes in Brisbane, but when they became dads almost five years ago, they craved a tree change. Somewhere fresh, quiet and green, where their daughter Olivia could run free and have lots of pets. Late last year, they went for a drive to Dulong and after a scones stopover in Flaxton and a look around Montville, headed to Maleny. They’d never visited the town and were surprised to find a thriving, arty village. When they noticed an ‘open home’ sign, they followed it on a whim. 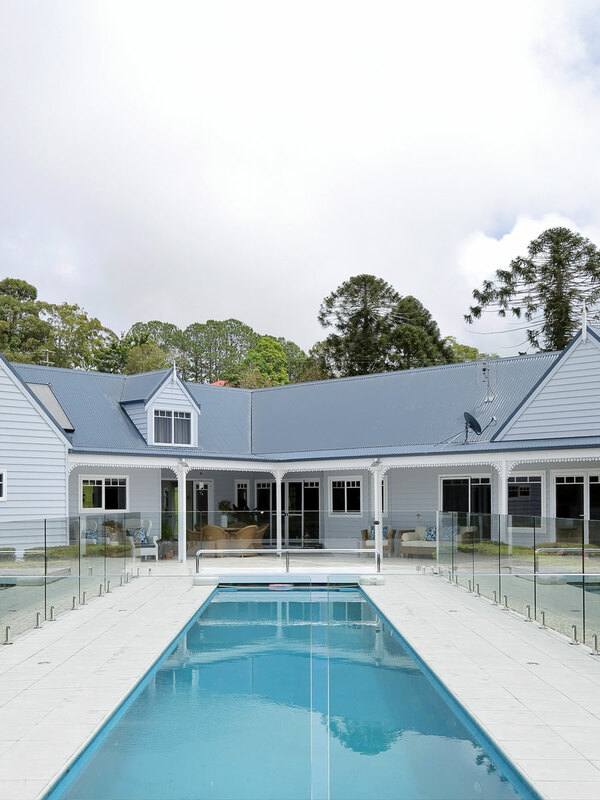 They moved into the Hamptons-style country house in North Maleny in October last year and set about redecorating. Simon, a personal trainer, has been a stay-at-home dad since he and partner Holt had Olivia through a surrogate mother in America. Holt runs his own IT business with an office in Maleny, leaving Simon to be the stay-at-home dad. Simon’s parents live in their own quarters on the property, so Olivia has plenty of contact with her grandparents. With a little help from his parents, Simon does most of the cleaning, mowing and gardening, taking pride in keeping the 22-acre property looking pristine. Out the back is a lap pool surrounded by a formal garden, and with the Obi Obi Creek running along the bottom of the property, they have their own private waterhole. However, the house is beautiful. A welcoming, breezy entrance separates two wings of the home. To the left are the family quarters, while to the right is a self-contained guest wing that can be closed off for complete privacy. High ceilings and dormer windows create the impression of space. Each of the four bedrooms has its own bathroom and the sunken bath in the guest wing is delightful, set against a large window overlooking nothing but rolling green hills and a big hinterland sky. “We were wanting a smaller house,” says Simon. Simon has a knack for styling and has become an influencer through his popular Champagne Dad Style Instagram page, which has 18,000 followers. He’s constantly being sent household products to review and accepts only products he would genuinely use. He’s turned down multiple offers for Olivia to review products. Simon had always enjoyed styling homes, so he shared photos of himself, Holt and Olivia at home and on their travels, and it took off. In styling their Maleny home, he aimed for a contemporary yet cosy look, which has a spacious, bright feel, with splashes of blue in the soft furnishings and white tiles throughout. Like the rest of the house, the kitchen has a spacious feel that’s both country and contemporary, with a black Falcon stove, cathedral ceilings and stone benchtops. A window overlooking the outdoor entertaining area and pool is filled with pot plants and every item is stowed with precision. The exception to Simon’s impeccable orderliness is four-year-old Olivia’s bedroom, a perfect little princess hangout with plenty of pink, a double bed and her own ensuite complete with piles of makeup she loves to play with. Olivia will start school next year, freeing up Simon’s time for a new online business venture, selling photographic prints he makes himself and will print at home. For now, Simon has his hands full with Olivia, the chickens, the cat Theodore and their three miniature Galloway cows Noah, Nigel and Nero, which they bought from Byron Bay Galloway stud. They make great pets for Olivia and they mostly look after themselves, he says. While the house no doubt appears perfect to most onlookers, there’s still plenty Simon would like to do before it feels exactly right – renovate the kitchen, lay carpet in the bedrooms, install plantation fans… But for now, he has a little lady to prepare for school and reckons he’ll shed quite a few tears on her first day.